Personalized address labels are the excellent marketing medium that help embellish packages or envelopes, and makes them standout in a cluttered mailbox. The labels printed with the desired text/logo, artworks, colors, designs and so forth, give the product packages a unique and professional look. They can be very beneficial to businesses as they unknowingly make a big impression on the clients. At Performance Label Company (PLC), we offer an extensive range of address labels with the best print quality at cost-effective price ranges. By keeping track of the modern market developments, we provide high quality and visually appealing labels exceeding the customers’ expectations. PLC is a name you can trust when it comes to the manufacturing of address labels. The following capabilities have helped us produce fit for purpose labels that sand out of the shelf. Add a Professional Touch: Personalized address labels with the company’s logo, texts and colors create a positive impression on the receiver. It is a great branding technique that adds professionalism, whilst helping stay top in the minds of the customers. Save Time: With the use of address labels, individuals/businesses can save lots of time and human labor, which would be otherwise spent on handwriting the address on every product packaging and mailing. Improve Accuracy: How unprofessional it will be if a receiver/client reads a handwritten address label with indecipherable letters and spelling mistakes? With printed address labels, businesses need not have to worry about such issues. Versatility: Address labels are available in a wide range of sizes and design possibilities. This provides the businesses with the versatility to choose the right that suits their needs. Conformance to Standards: Address labels we produce are thoroughly tested, validated, and verified to ensure adherence to industry standards. At PLC, we are constantly investing in new technologies, which enable us producing different types of address labels that enhance our clients’ packaging and help drive sales. 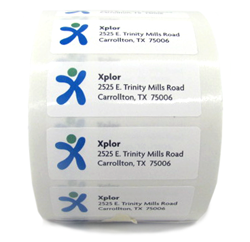 We can bring you the following address labels to enhance the brands’ presence. Whether you are planning on sending out a large batch of packaging/mailing, let us know. We continuously discover and explore new ways to produce printable, ready-for-use, stylish, and personalized address labels. We are constantly looking to break new grounds by having the address labels produced according to the specifications in quick turnaround times. No matter how complex your design is, we are all equipped to create the right address labels that are sure to get noticed!